Two years ago, on December 29, 2010 at approximately 1:26 p.m., I entered a state disbelief. Total befuddlement. See, I was doing my daily stretches, working on my famously tighter-than-a pair-of jeans-three-sizes-too-small hamstrings, when I accidentally grabbed my toes. I know, MY TOES. Huh? What the hell was going on!? Gymnasts grab their toes. Yogi masters grab their toes. Chinese acrobats who specialize in contortionism grab their toes. People with MS don’t grab their toes. I have the flexibility of Melba toast. Reaching my kneecaps and maybe—maybe— touching my shins (if I cheated and bent my knees) was my elasticity Everest. Seriously, the last time I touched my toes was back in seventh grade as a yellow belt in Taekwondo. And I did that only because my instructor was a 7th degree black belt championship fighter with a short fuse for kids who weren’t limber. But there I was, at the age of 42 with multiple sclerosis-induced spasticity my daily enemy, wrapping my hands around my feet. Either I had just torn my hamstring off my femur necessitating urgent surgery and months of rehab… or my 15- to 30-minute daily stretching routine was actually working. I’ll be danged, it was the latter. 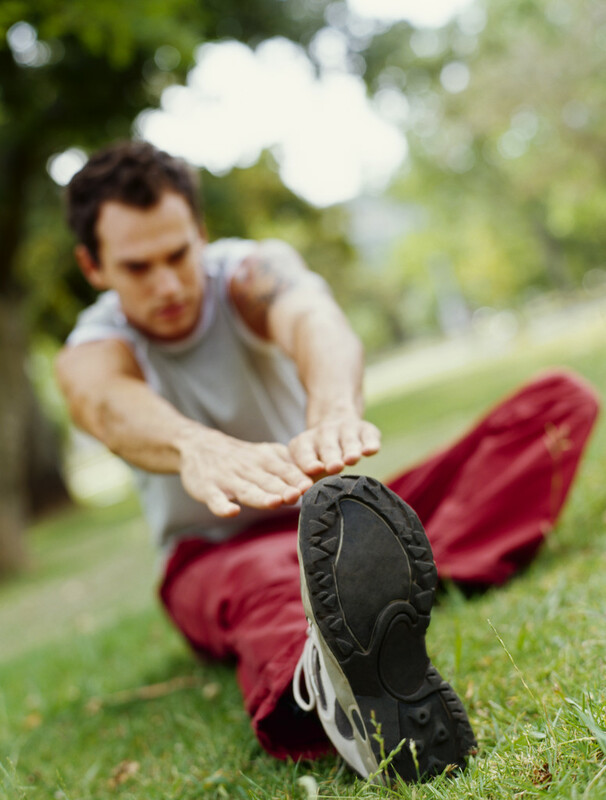 While stretching has always been a part of my regular exercise, rarely was it a focus. That all changed when in 2009 my spasticity went into a higher gear. So for months I had been far more faithful about getting in at least one stretching session per day in the hopes that maybe I would be able to hold off taking Baclofen and other anti-spasticity drugs. Heck, I’d been preaching the benefits of stretching for years on ActiveMSers as the single most important exercise you can do for your MS. It was about time I got off my pulpit and practiced. The gains were at first imperceptible. I never noticed that I could reach my shins without cheating. Then my ankles. While my painful spasticity had faded, I never put two-and-two together. And then… and then, I touched my toes. Originally published December 29th, 2010. Edited for clarity. Before MS, I played soccer for 20 years, and I could never touch my toes. My shin guards were my usual lofty goal. Then came MS and spasticity hell, but it did prompt me to go to some yoga classes. After a month of going to classes once a week and stretching almost every day, the toes are within reach! The spasticity is better, but the only sure thing I've found to help with my legs is aerobic exercise which for me is running or rowing. I'm glad to hear you are having such success.